So I was on the wrap up panel at MIPTV 2012 - thanks ReedMIDEM and James for having me. It was a thoroughly enjoyable experience with some quite brilliant people in the sofa and chairs beside me. I was discussing a transmedia project I’d been advising a bit on with my wife today, when she – in the quite brilliant way she has of hitting the nail on the head – pointed out that transmedia, should the mythology and story world allow for it, could be a brilliant tool for reaching not just one target audience, but a number of target audiences in a way that engages them on their own while still keeping them loosely knit together through the common narrative superstructure. Targeting the 65+ segment, television, magazines, books or radio or less complex web based offerings might be the best way to get through, with a storyline that engages them the most. Will try not to be prejudiced, but probably something along the not-too-fast-paced but drama based might do the trick? Targeting the 35+ segment, i.e. the children of the aforementioned segment, a more quick-paced drama, played out on mobile/tablets, television or VOD and online, based in the same world as the drama for the 65+ is based in, perhaps even overlapping, so that the generations have something to talk about and compare when they meet? And targeting 15+, the grandchildren of the 65+ segment, a youth drama, perhaps mostly on YouTube, perhaps character-driven to a large extent; could end up a television series as well. But yes, this also based in the same story world as the two above; also overlapping and crashing into the other storylines from time to time. Much like real life! This would take a bit more planning and a bit more funding than just the one tv-series would do, of course. We are essentially looking at producing three productions, connected to each other. But the end result could be pretty neat indeed. I'd love to try to give such a thing a go. I got an idea yesterday and I’d be mighty glad if someone told me if this exists already. See, I’d like to be able to place myself as an Avatar on different places on the web. On my own home page or blog, on blog articles where I’ve been interviewed or where I have contributed etc. I’d want this Avatar to be a bit sentient. The Avatar is displayed on the page I put it on and people can talk to it and ask questions about how I look at things and what my opinion is. The key thing here would be to have the Avatar constantly crawl the net to find if the real me has written, commented, blogged or been interview about anything on any given subject since the last time. These comments or opinions or facts are then added by the Avatar to its repertoar of answers, complementing or erasing already existing opinions. A brief post on funding and transmedia; I read the Storify of the latest StoryCode event with great interest, as I – along with most other practicioners in this field – am constantly on the lookout for new ways to get the funding in to create and produce and distribute what I want to create and produce and distribute. Great graph from Futurelab, "Trough of Sorrow". Applies to transmedia projects as well as startups, I'd say. Split it up. Take a good look at your content and what platforms you intend to distribute it on. Is part of it good enough to make a television fiction series or a television documentary, the revenues from this alone might pay for the rest of the transmedia venture (depending on scope, naturally), and also open up for roll-out of the full transmedia experience in global territories. If you can hook into a current trend with the part of your project you’ve designed to work as a graphic novel, you might get either a publishing deal or rack up some revenue through e-books. Bottom line; look at the parts of your transmedia project from a revenue perspective; add them all together, and you might just achieve your goal. There are probably as many ways to get the full funding as there are transmedia projects. My advice would be to be creative, not only when it comes to your content, but also with regards to your funding. I read an interesting article on the success story of Game of Thrones a couple of days ago, over at Lost Remote. GoT has been one of the transmedia marketing success stories I’ve pointed to in talks and articles over the past year, what with their ”Smells of Westeros” and ”Food of Westeros” campaigns. I was very happy to see that HBO were rewarded with an audience for the first episode of the second season that was 73% up on the first episode of the first season. Now, the social media buzz around GoT is indeed remarkable. HBO are evidently doing all they can to maintain and grow this buzz, and it would seem it is paying off handsomely. In the article I read, no one was speaking about ”transmedia” per say. Still, the principles of transmedia storytelling are what made all the social buzz possible. George R.R. Martin has created an enormously rich story world, he already has a great number of story archs up in the air and the mythology and the narrative superstructure are both firmly in place. This is what I would recommend anyone thinking of transmedia and television, in a drama/fiction setting, to take note of and even replicate. Making a mythology as rich as that of GoT might seem excessive, but look at the possibilities it generates for entry points, character interaction, fan art and fan fiction and so on! If you’re working on a fantasy story, build it all as eloquently as GoT, or at least strive to. If your fiction is more of the contemporary kind, make your own jigsaw puzzle out of facts from the world around you, glueing the pieces together with just the right amount of fiction from yourself and your creative brain. Above all, plan for the audience to join in. The HBO example in the article above is getting there. I do believe there are new routes to explore and new ways to implement, to tie the audience even tighter to your content. So, MIPTV 2012 is done and dusted, along with MIPFormats and the inaugural MIPCube. The days – and the nights – flew by at a breathtaking pace, so now I find myself in Antibes with my family for what I definitely feel is a well-earned vacation. The TV industry is moving in the right direction. With this I mean that amongst the clutter of animated cuddly bears and 14-hour long drama series with serious bearded men from the Middle East, there is a growing number of people in the TV industry who get that there is a real need for everyone to take note of where the audience is heading and make plans for how to be there to welcome them when the major part of them arrive. Granted, the ways of doing so vary wildly, from Lisa Hsia and her Master Chef-transmedia-extension to companies geared solely towards connected TV-sets, and everything in between. Still, I was positively surprised to see TV people talking to tech people and actually discussing issues and challenges, not just mmm-ing and aahh-ing along. Alongside the tv industry are the brands. These have in several cases shown a readiness to go beyond their previous limits when it comes to offering true and engaging stories, and to some extent even build it all into something touching on transmedia storytelling principles. Still, many simply do not have a clue. As transmedia can help in so many ways, it just feels a bit silly not to utilize it to get deeper audience engagement, more serious interactive possibilities and a firmer story world, or mythology, to build further story archs on and offer logical and immersive entry points into. 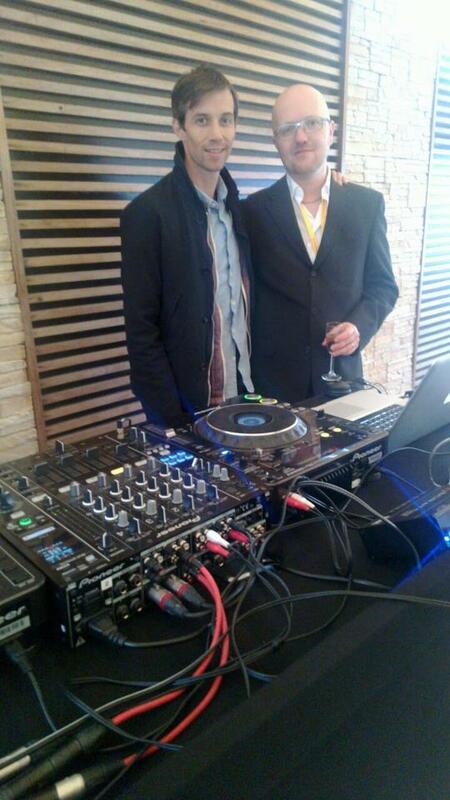 There were a lot of transmedia creators and producers in Cannes last week. Some actually are, while others are more of the kind that like to jump on any buzzword that might buy them a free lunch or three. All in all, I can’t help but observe that the term itself is becoming pretty diluted. Add to this the fact that everyone who actually knows something about transmedia seem to find it impossible to talk about transmedia without starting with ”aaaand, so, my view of transmedis is…” followed by a description that differs less than 2% from the description of the previous speaker. 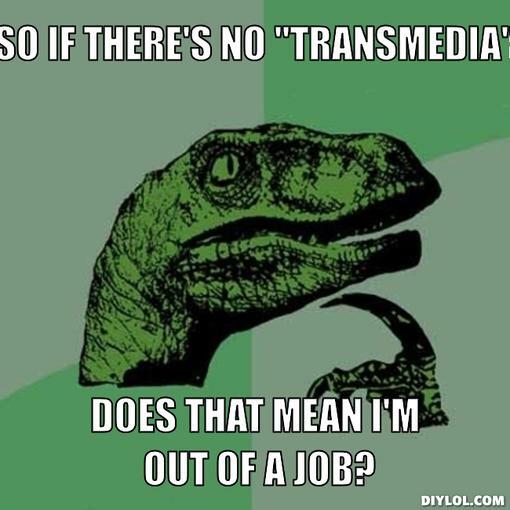 For the first time in my life, I’ve actually felt a yearning for a definite definition of ”transmedia”, if only to be able to get rid of all these definitions hopping about. Many people, many companies and many apps on exhibit (especially at MIPCube) were about taking the TV experience into a social direction. For the most time though, this was about pointing people to the Facebook page and to the correct hashtag to use if tweeting about the program. Still, less than one third of new shows commissioned actually launch an FB page as well, which is just appalling statistics. I.e., what people in the biz are trying to do is control the uncontrollable, harness that which can’t be harnessed, basically using tactics in a social space that never should be used in a social pace. Here, I have a brilliant idea; hopefully you’ll see something more of it sooner than later. This year; Jean Reno, Miss World, some people from Jersey Shore, and at the Nokia cocktail party at C Beach, to my total delight, Sam from Zero 7. Excellent! All in all a very giving six days. I’ll end here, but I reserve the right to add on to this post as soon as I’m not on a sketchy wifi on the Cote d’Azur.